It was a great easter weekend! I went to visit my parents in PA for Easter this year and it was so much fun. I love the traditions of Easter, and being home - made it especially fun to relive some of those traditions. 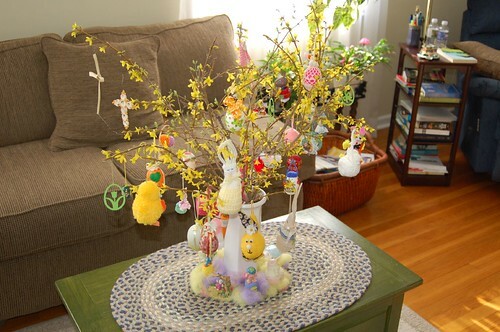 I come from a long line of crafty women and this Easter "Egg tree" is a perfect example of this. It's covered in handmade ornaments, mostly made by my grandmothers and my mother. I think I helped with a few when I was little too. 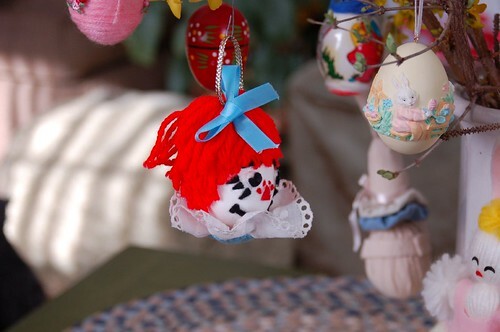 My maternal grandmother made this Raggedy Ann egg - isn't it the cutest? My mom and paternal grandmother made this egg - Look it's tatting! The flowers are tatted! I am so amazed at this. I never knew anyone who tatted (or at least I thought I hadn't) and seeing this egg was a real treat. 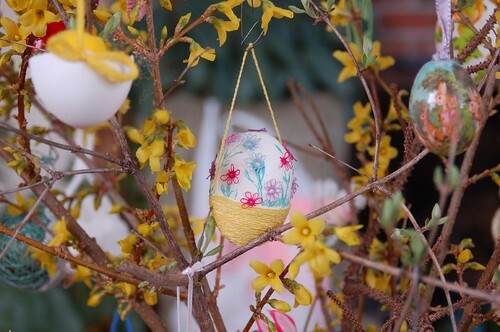 I was inspired by all this easter creativity and I decided to add to the egg tree with my own creation,. 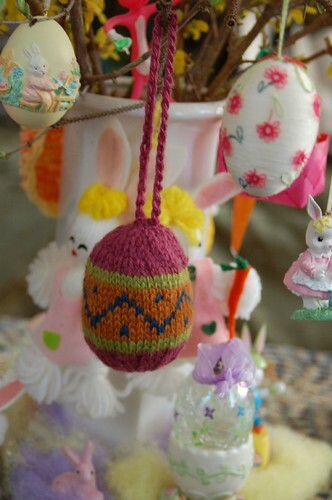 I knit a colorwork egg from this pattern... and added it to the collection. I hope to add to the tree every year. 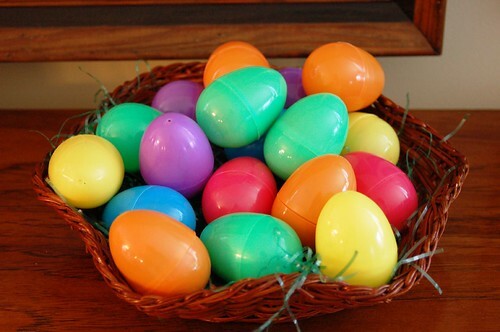 We got lots of easter candy and plastic eggs and hid them all over the house. It's a good thing we counted the eggs before we hid them this year - because there have been years when we never found all the eggs! 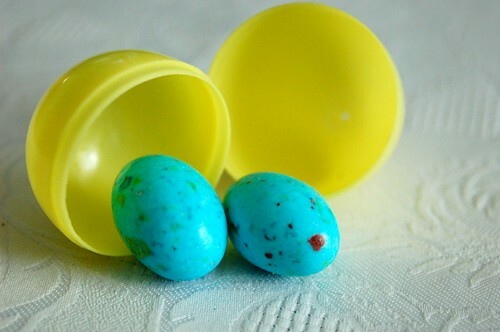 When my parents moved a few years ago, they found eggs with 20 year old candy inside! hehehe! I think overdid the candy a bit... ok, a lot! It's back on the wagon for me now that easter is over. So - did anyone crack into a soda yet? I didn't. I am going to try to keep it going. Confession time - who cracked one open? Who made it the full 40 days? I promised presents for everyone who made it - so do tell! Include your email address in the comments if Blogger doesn't have it. I'll be contacting everyone who made it for their address. I made it!!!!!!!!!!!! yay! And I must admit - I cracked one....until I took a taste and saw it was old. (my mom can't keep non-expired soda in the house - Eeewww!) 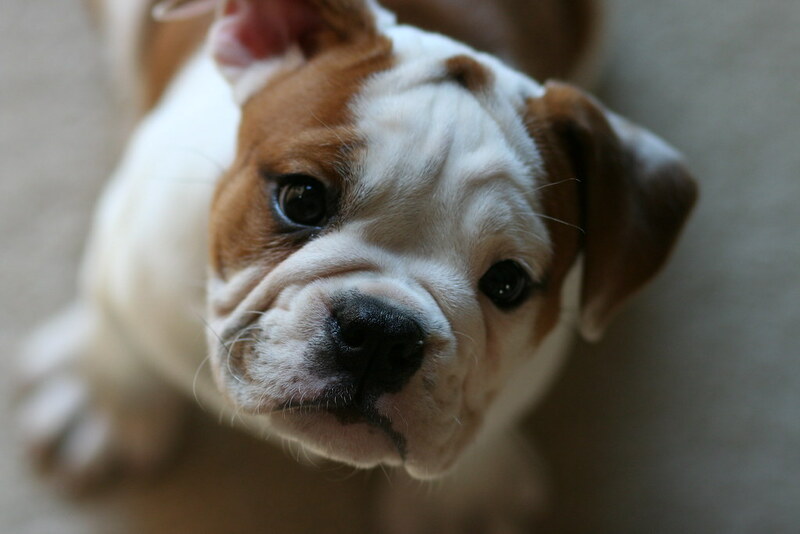 I am waiting to go hit McDonalds to have one. But....I am going to really cut down and save my consumption for eating out and stuff - not every day. The egg tree is lovely! Your colorwork egg is beautiful. I had a diet coke, but only cause I forgot I wasnt having them. (It was really early on a roadtrip, and I was really tired.) I didnt finish it though - cause it tasted gross. I will continue to be diet coke free. Your easter egg tree is SO COOL!!! I did eat lots of chocolate though, even though I said I should cut back. I really like your knitted egg. I MADE IT!!! Well with a couple uh oh's! Sonic gave me the wrong drink once, and it took a taste to catch that it wasn't tea, and when I was really sick with a virus the only thing I could keep down was a few sips of a cherry coke...I'm not counting it either, as I prayed and prayed for forgiveness! Easter morning I had a little cherry coke, and a little last night. Its so strong I eventually poured it out and got some tea. I'm not giving it up totally, just cutting back drastically. This weekend will tell the tale. yay for no soda! I had any and don't think I will for a while. Girls want to have a egg hunt with you! We were in the Lehigh Valley for Easter too. 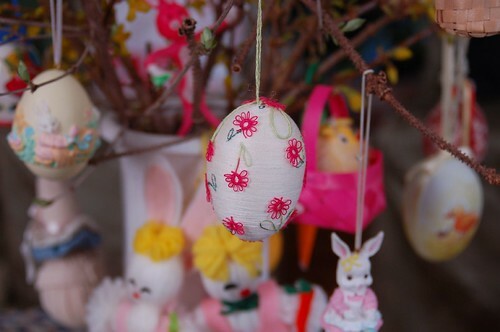 Glad to hear you had a great holiday - love the Easter egg tree. That is a wonderful tree and beautiful eggs! In the past, we wouldn't find all of the eggs at my grandma's and their dog would find them and eat the chocolates that following summer. It still happens. What a lovely egg to add to the family tradition. They are something you'll always cherish. My great Aunt tatted ~ I have two of her snowflakes on my Christmas tree. I made it!! So happy to feel like I don't want any either! I love the tree and the history there. Your colorwork egg is a wonderful addition. I made it, and waited to crack into my first Coke on Monday. Sad to say, it tasted funny. I haven't had one since. Only had one Caramel Kiss, and still haven't be able to go to the shop to buy anything!!! I made it. No caffeine and still going strong. Wow! I love your Easter Egg Tree! All I managed to do was color some eggs. Congrats on your DC fast! Good job!